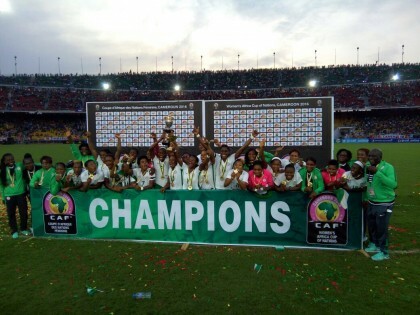 The Super Falcons of Nigeria has won the 10th Edition of African Women’s Cup of Nation, AWCON after beating Cameroon 1-0 in Yaounde. Nigeria by this victory has now clinched the AWCON title for a record eight times. An 86th minute goal from Desire Oparanozie for the Super Falcons was enough to dash the Indomitable Lionesses of Cameroon’s hope of wining their first AWCON title. The final match was played at the Ahmadou Ahidjo Omnisports Stadium in Yaoundé, a forty thousand capacity stadium. Meanwhile, the coach of the Super Falcons, Flowrence Omagbemi has made history as the first person to win the AWCON as a player and a coach.